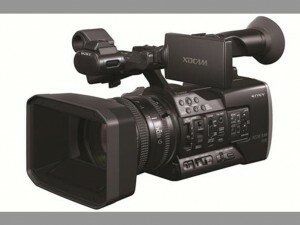 launched the PXW-X160, the latest addition to the Sony XDCAM™ Series of professional camcorders. The PXW-X160 features three 1/3” Full HD Exmor® CMOS sensors and a newly developed 25x optical zoom G-Lens that extends from a 26mm wide angle. It can record in XAVC Intra and Long GOP, enabling 10-bit sampling for high-definition recordings with rich tonal expression, as well as MPEG HD422 at 50 Mbps, a format widely preferred by today’s broadcasters and production houses. It can also record in MPEG HD420 at 35 Mbps, AVCHD™ and DV formats. This advanced camcorder has been created to satisfy the needs of broadcasters, production houses and corporate and event productions, with performance and features that are ideally suited for news, documentaries, events, and more. The PXW-X160 is a follow-up to the currently popular Sony HXR-NX5E and PMW-150, and is expected to become a strong performer in the field. The PXW-X160 differs from the previously announced PXW-X180 in the omission of features such as wireless functionality, NFC, and GPS, effectively lowering the price point while maintaining the same high level of performance. “Our XDCAM Line-up just keeps getting better: this latest addition brings all the latest key Sony features at an affordable price to users around the world” said Bill Drummond, Strategic Marketing Manager, Entry Level Production at Sony. This new lens delivers uncompromised Sony G Lens quality and a 26 mm angle of view at the wide end of its 25x zoom range (35 mm equivalent: 26 mm to 650 mm). That’s more than enough range for a wide variety of shooting situations. Independent manual zoom and focus rings with end-stop and iris control are provided, and a slide mechanism on the focus ring enables easy switching between auto and manual focusing. Sony’s Exmor™ 3CMOS Sensor system provides independent 1/3” CMOS image sensors for the red, blue, and green colour channels, each with 2.07 effective megapixels (16:9). The result is high resolution and sensitivity that contribute to superior colour reproduction. An advanced image processor that features sophisticated noise reduction and distortion compensation is instrumental in delivering superb detail and texture reproduction, with image quality settings rivalling high-end broadcast camcorders. In addition to XAVC Intra/Long GOP, the PXW-X160 can record in MPEG2, AVCHD, and DV format. The MXF file format is used for XAVC recording, efficiently compressing full HD (1920 x 1080) resolution using the MPEG-4 AVC/H.264 codec. Image sampling is 4:2:2 10-bit with Intra-frame compression at 112 Mbps, or high-efficiency Long-GOP compression at 50/35/25 Mbps. To provide compatibility with a variety of workflows, the PXW-X160 features two SxS memory card slots for high-speed read/write capability. An XQD card adaptor allows recording to XQD memory cards, and an SD card adaptor enables recording to SD memory cards for maximum economy when shooting for extended periods. The PXW-X160 is the first professional Sony camcorders to feature a continuously variable ND filter. A new system that electronically controls density enables continuous adjustment from 1/4 ND to 1/128 ND via a simple dial operation. In conjunction with iris and shutter speed settings that control depth of field and brightness, this advanced filter facilitates shooting techniques such as the use of slow shutter in daylight and other bright conditions. For operators who prefer the conventional ND selector interface, the camcorder features a dual ND filter control mechanism that provides both continuous electronic control and the standard four-position switch. The PXW-X160 is equipped with a 3.5 type QHD LCD panel (960 x 540 x RGB, 16:9) that provides easy viewing in a wide range of lighting conditions. Both models also feature a 0.5 type OLED viewfinder (1024 x 768 x RGB, 3:4). High resolution makes precise manual focus easy. Compared to LCOS devices, there is no colour breakup and viewing comfort is significantly improved. Compatible accessories attached to the Multi-Interface (MI) Shoe can be controlled from the PXW-X160. The HVL-LBPC video light, for example, can be switched on and off from the camcorder. Power and audio connections for a UWP-D11 or UWP-D12 wireless microphone receiver are made via the MI Shoe, minimizing the need for extra batteries and additional cabling.